Today’s post is by one of our Master’s students, Josh Laird. Josh is a first-year student who is conducting research on taxonomic diversity associated with hydrothermal vents in the Pierre Shale. Josh discusses his work with a significant invertebrate collection. Currently I am in the process of curating the portion Bishop Decapod Collection that is stored in the Museum of Geology. The collection is dominated by crabs and lobsters from the Cretaceous Western Interior Seaway, mostly from the Pierre Shale of South Dakota. It is not an exaggeration to state that there are thousands of individual specimens in this collection. All collections have their own unique hurdles to overcome in order to successfully integrate into the main body of collections and the Bishop Collection is no different. Challenges present in two ways: 1. Unpacking and storing thousands of concretions, and 2. Making the specimens and their associated information easily located and utilized. When unpacking specimens it is possible to find everything from individuals that have been displayed on a museum floor, to sample bags of fragmented lobsters with sediment, and even unbroken, ten pound concretions. I remove these specimens from their original containers and place them into acid-free paperboard boxes and/or glass vials. Specimens are then stored by locality and given a catalog number. Assigning a catalog number can surprisingly be much more difficult than I at first expected. Depending on the nature of the specimens they are assigned catalog numbers differently. Many times there are hundreds of specimens from a single locality. As such, many specimens do not have very much, if any, information specific to the individual. These specimens are grouped together as a single “lot” of many specimens and assigned a single catalog number. When specimens are fragmented, or have their own information (such as species identification, photographs, etc.) they are given their own catalog number to keep information together and prevent fragments from becoming lost. A single Linuparus sp. 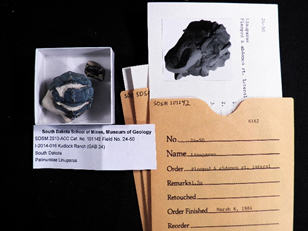 specimen on the left was assigned a single catalog number because it had unique information and fragments that could be lost in a general lot. 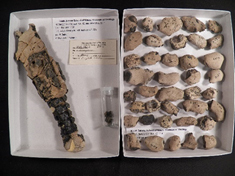 On the right, thirty-nine crabs in concretion were placed in a lot and assigned a single catalog number. Once a specimen is assigned a catalog number, I input all of the associated information into the Specify Database for the museum. We use this database to digitize information such as where specimens were collected, who collected them, etc., as well as keep track of where specimens and their associated information are stored in the building. Currently I have assigned nearly 350 catalog numbers to this collection and I feel it’s safe to say that the finished project will include at least 1000 numbers. In the next stage of this project, Specify will also be used to store scans of original information for the specimens. A Linuparus sp. abdomen and its associated information which will be scanned and connected to the specimen through the Specify database.